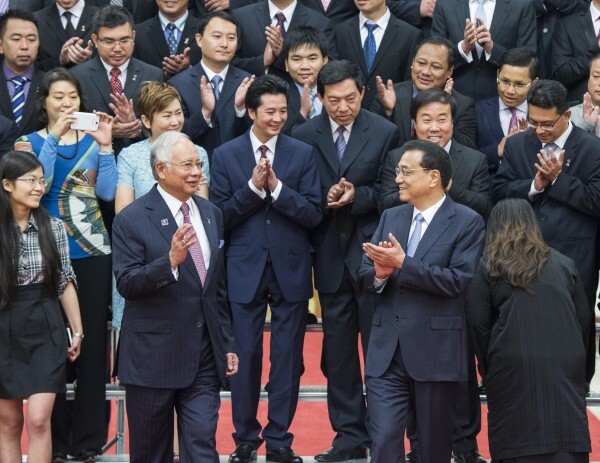 Chinese and Malaysian leaders celebrated 40 years of ties in Beijing on Saturday by stressing the need for Asian cooperation through such organisations as the Association of Southeast Asian Nations (ASEAN). In a joint communique commemorating 40 years since the establishment of bilateral diplomatic ties, both countries pledged to increase China-ASEAN cooperation, set up the Maritime Silk Road, and hold the ASEAN Regional Forum Disaster Relief Exercise in Kuala Lumpur in February 2015. Chinese Premier Li Keqiang and visiting Malaysian Prime Minister Najib Razak also focused on peaceful resolutions to the South China Sea issues in which Vietnam and other countries have disputed Beijing’s claims on marine territory and groups of islands in the area. China and Malaysia both reiterated the position held by the most recent ASEAN Summit, which was held in Myanmar in early May. At the conclusion of the Summit, a communique stressed that all parties to the maritime dispute should exercise self-restraint and settle their differences by peaceful means and friendly consultations and negotiations. The ASEAN Summit also stressed the principles of international law, such as the United Nations Convention on the Law of the Sea, as mechanisms for the resolution of such disputes. On Saturday, Li and Razak both agreed that “intervention or involvement of parties not directly concerned could be counter-productive and further complicate the aforementioned differences”. In the meantime, Li praised the depth of Chinese-Malaysian ties and the committed trade relationship which totaled some $100 billion in 2014. For his part, Razak expressed sorrow and apologized to the families of the Malaysian Airlines MH370 which vanished en route to Beijing more than two months ago. “Like all friendships, ours is sometimes tested. Malaysia was deeply saddened by the tragic disappearance of Flight MH370, with 50 Malaysian passengers and crew and 154 Chinese passengers on board. “Facing a mystery without precedent, we were grateful for the support of the Chinese government, which has spared no expense in the search effort. We will not rest until the plane is found,” he said in remarks carried by the Malay Mail. It was 40 years ago that Razak’s father, then Malaysian Prime Minister Tun Abdul Razak, signed a Joint Communique with then Chinese Premier Zhou Enlai and ushered in an era of prosperous bilateral ties, and making Malaysia the first ASEAN member to establish ties with China. “I feel not just the responsibility of government, but the responsibility to my father — to continue his legacy and ensure the deepening of Malaysia-China ties,” Razak said during a speech at the commemoration ceremony. Li responded by saying that in the past 40 years, Chinese-Malaysian ties have been the “shining example for the rest of the world”. “We must ensure that our relations must be reflected in all of our foreign policies,” Li added.